The unveiling of SKYBOLT at Salford University, UK. 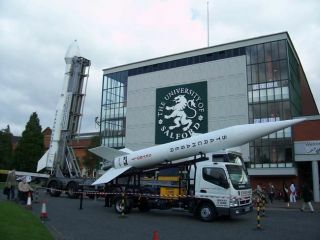 The U.K.-based rocket manufacturing company Starchaser unveiled Thursday its first prototype rocket at Salford University. Called SKYBOLT, the unmanned rocket is designed to carry science experiments up to 83 miles (130 km) into space. "The rocket is reusable so we're planning to launch it at a relatively low altitude first and relaunch it to a higher altitude," said Steve Bennett, Managing Director of Manchester-based Starchaser Industries Ltd. and a Salford University Space lecturer. The unveiling happened the same day Sir Richard Branson's Virgin Galactic revealed the interior concept of its SpaceShipTwo at Wired Magazine's NextFest in New York City. Like SpaceShipTwo, the SKYBOLT will break new ground by using non-traditional fuel system. SKYBOLT will be one of the first reusable rockets to be powered with liquid fuel, a move that slashes traditional launch costs. Similar to a car at a gas station, the liquid propellant systems allow the rocket to be reused by simply refueling it. "You just put fresh liquid oxygen and fresh kerosene and you can go again," Bennett told SPACE.com. Another advantage of this technology is that rockets can achieve liftoff with less acceleration, allowing delicate equipment to be placed on board. Until now, rockets used solid propellants and when you light those things up you get massive acceleration, maybe 15 or 20 g's, Bennett said. "So you can't launch biological payloads on regular sounding rockets. So we're planning to open up a whole new market." Starchaser plans to launch SKYBOLT at the end of 2007 from a launch site in the United States. If the rocket is not ready in time, it might lift off later from Sweden or even Australia. "Once we have the rocket ready we're going to go with the first launch site that can accommodate us," Bennett said. However, a major hurdle to launching from different countries is transporting missile technology around the globe. In the United States, for example, International Traffic in Arms Regulations (ITAR), places strict regulations on import and export of defense material, which require many permits. "One of the things that we're hoping to do is develop a lot of the rocket system in the U.S.," Bennett said. "That way if it is American home grown then there's not so much a problem transporting the rocket." The 2007 launch of SKYBOLT will lead the way for Starchaser's first manned trip, scheduled for 2009. The manned trip will include a capsule that will sit on top of the rocket and will carry 3 passengers on a suborbital journey to an altitude of almost 100 miles. The trip will last about a half hour. "It goes really fast, we get up to speeds of nearly 4,000 miles per hour," Bennett said. "It only takes you about four or five minutes to get up there. It takes slightly longer to come back because we're on the big parachutes now." The trip will cost a mere 98,000 United Kingdom Pounds, or about $183,000 U.S. A two and a half hour flight aboard SpaceShipTwo will run the Branson tourist about $200,000 U.S.
Bennett thinks perhaps he could beat Branson to space. "The race is on," he said. "This is a new space race. We're building the vehicles, we're building the hardware, we're building capsules, we've done manned drop tests of capsules, we're building engines," he said. "We're really going for it. You know we're not just buying a ready made system from someone else so we have more control over what it is we do and I think we're going to probably beat him to the punch." Like Branson, Bennett will be on the already booked first flight. But he says they're also currently taking bookings for the subsequent flights. " We have a list on our website. If you wanna fly with us, just put your name on there."